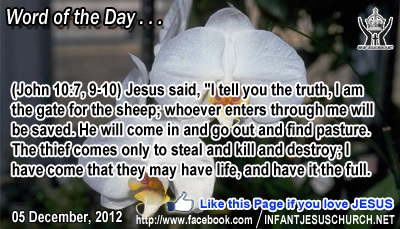 John 10:7, 9-10: Jesus said, "I tell you the truth, I am the gate for the sheep; whoever enters through me will be saved. He will come in and go out and find pasture. The thief comes only to steal and kill and destroy; I have come that they may have life, and have it the full. Holy and Righteous Father, we confess that sometimes we play life too cautiously, not risking failure and loss and not reaching for your opportunities and your concerns. Give us a heart that yearns to live life in all its fullness by seeking after your will, Jesus' example and the Holy Spirit's leading in our resolutions today, and always. Through the name of Infant Jesus we pray. Amen. 29And Jesus went on from there and passed along the Sea of Galilee. And he went up on the mountain, and sat down there. 30And great crowds came to him, bringing with them the lame, the maimed, the blind, the dumb, and many others, and they put them at his feet, and he healed them, 31so that the throng wondered, when they saw the dumb speaking, the maimed whole, the lame walking, and the blind seeing; and they glorified the God of Israel. 32Then Jesus called his disciples to him and said, "I have compassion on the crowd, because they have been with me now three days, and have nothing to eat; and I am unwilling to send them away hungry, lest they faint on the way." 33And the disciples said to him, "Where are we to get bread enough in the desert to feed so great a crowd?" 34And Jesus said to them, "How many loaves have you?" They said, "Seven, and a few small fish." 35And commanding the crowd to sit down on the ground, 36he took the seven loaves and the fish, and having given thanks he broke them and gave them to the disciples, and the disciples gave them to the crowds. 37And they all ate and were satisfied; and they took up seven baskets full of the broken pieces left over. In the reproduction of the loaves and fishes we see a sign and a symbol of what God always does. God knows our requires and he cares. When God gives, he gives in plenty. The gospel account records that the leftovers from the miraculous meal was more than seven times the amount they began with. Seven is a symbol of completion and completeness. When God gives, he gives until we are fulfilled. When God works for his people he gives abundantly - more than we could deserve and more than we need. He nourishes us with his life-giving word and with the bread of heaven. In the kingdom of heaven God will feast us at his dinner table. Are you satisfied with God's provision for you? And do we long with hopeful for the coming of his kingdom in all its fullness? Loving Infant Jesus, you alone can satisfy the longing and hunger in our hearts. May we thirst for your kingdom and find joy in your presence. Give us the true bread of heaven and nurture us with your life-giving word.